The bridge had spanned the outlet of Marcy Dam. Photo by Phil Brown. 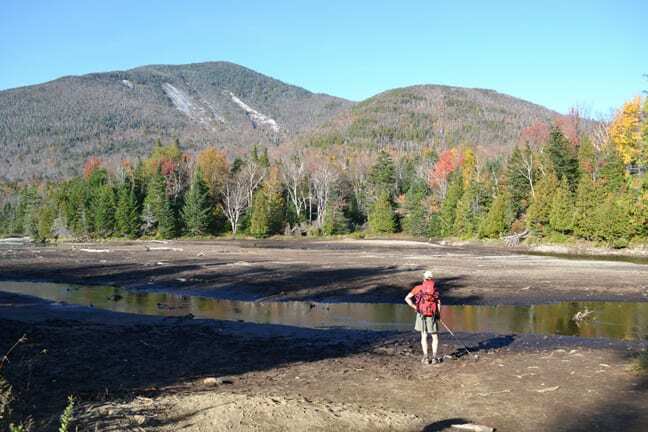 The rains from Irene washed away the bridge over Marcy Dam, one of the most well-traveled crossings in the High Peaks Wilderness, according to the state Department of Environmental Conservation. DEC spokesman David Winchell said the crossing is now impassable. He does not know when the bridge will be replaced. The bridge is used by hikers who access the High Peaks, including Mount Marcy, from Adirondak Loj via the highly popular Van Hoevenberg Trail. 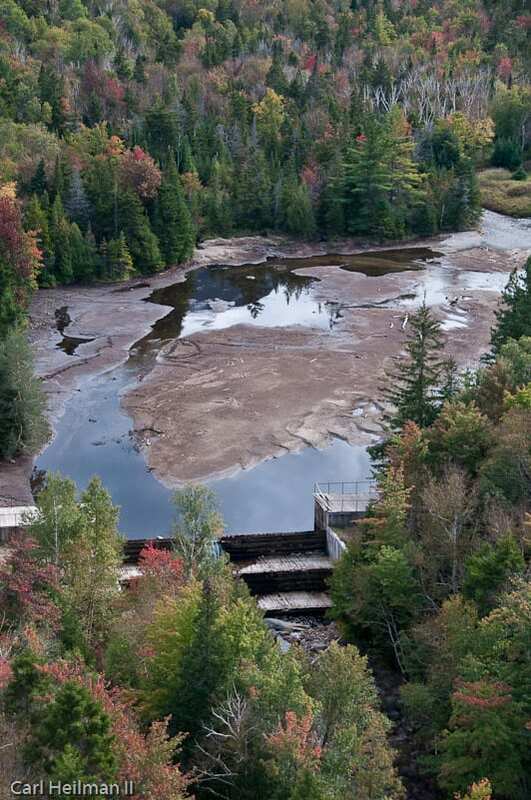 It crosses Marcy Brook as it spills out of Marcy Dam Pond. 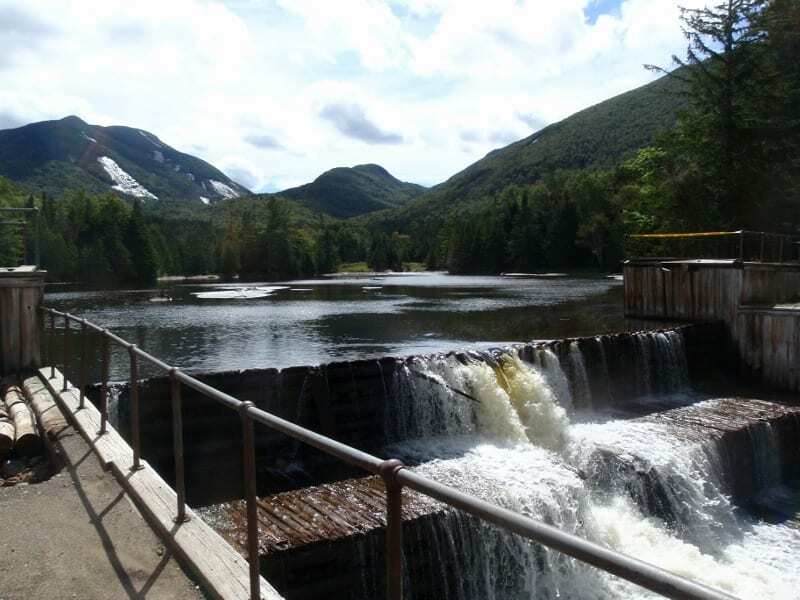 The Van Hoevenberg Trail reaches Marcy Dam after 2.3 miles. Hikers can still get to the other side of Marcy Brook by taking the Marcy Dam Truck Trail to Marcy Dam, but this approach is considerably longer. Winchell said DEC is encouraging people to stay out of the backcountry as the department evaluates the damage to trails and other facilities. He expects to have more information later today. Damage from Irene in the High Peaks seems extensive. Though authorities are still assessing what the torrential rains and flooding have done to roads, bridges, trails and other infrastucture, they do report that one key bridge for hikers has been washed away. The bridge on the Adirondack Loj Road closest to the Loj has washed out, cutting off the Loj, according to Lake Placid fire officials and the DEC.
Just got back from the dam. Bridge is totally gone. The dam itself is intact, but the water in the pond has lowered enough that mud is visible in the middle. I’m told damage to trails in the High Peaks region is extensive. The road to Adirondak Loj is closed as one bridge is washed out. I’m told the road to the Garden in Keene Valley also is washed out. DEC is urging people to stay out of the backcountry for now. Stay tuned for details. That dam was on its way out after years of no upkeep. It’s a shame such a beautiful site was allowed to get this bad. On the plus, maybe and over used area will get some needed rest. Sounds like there was a breech of sorts. Please find alternative places to go hiking until trails are re-opened. For example, the western Adirondacks region near Cranberry Lake reports that campgrounds and trails in that area are open. Just got back from 10 days of hiking and canoeing in the Keene vicinity and points west. Hard to believe that those streams that were at their usual mid-Summer low when we were paddling them) could do this kind of damage. Looking forward to hearing more about recovery efforts in the next Explorer. We hiked the Calamity Brook trail on 8/30/11 just before the “closed trail” sign was posted. The trail was fine with hardly any blow-downs or erosion. Two of the bridges are gone but Calamity Brook was easily rock-hopped in both places. I sent this info into the DEC and hopefully they can reopen the trail. The Herbert Brook Lean-To had been flooded above its base but all the water had receded to normal levels. This side of the park is fine IMHO. For those of you who already had vacations planned, if what they say about the Western part of the park is true (little to no damage), you should take the time to see the 5 ponds wilderness. True there’s no high peaks there but that doesn’t diminish from the beauty of the area and the opportunity to observe other natural settings. For what it’s worth, I have no idea of what the actual trail conditions are like over there, I’m basing my comments based on what Debbie Melita said in her post. There are plenty of great places to hike over in that area. Thanks for the updates Phil. Your photos speak the heart-wrenching truth. Deeply saddened by the news. I hope any remaining backpackers are getting out safely. Please keep us posted of efforts to help with trail repairs, etc. I read that retired General Anderson said the defense department spent 20 Billion bucks for air condition in Afghanistan! maybe we can start spening some money here in the good old USA and save our parks.